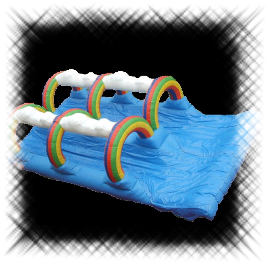 Cool off those sizzling summer days with our water Slip & Slide. Remember when slip and slides were just plastic over the ground with water? Well this unit is 27 feet of pure summer fun without the bumps. Do you like to compete? Then two lanes are better than one since two can compete to see who can slide the fastest. Reserve early.... this is a very popular unit in the summer. HUGE Monster sized dual lane slip and slide with a splashdown area at the end. 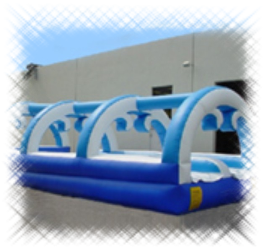 "Bigger Kids" need to reserve this unit for sliding competitions or just for some cool water fun. Who can resist this bright water slide? The misting system reduces water usage but provides cool fun for any age. The rock climbing wall makes it fun and challenging. This slide can be used wet or dry. This covered slide is a lot of fun, even for the larger kids. The cover keeps a cooler sliding area for children. 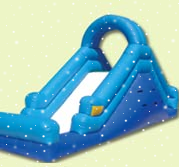 This slide can be used wet or dry. 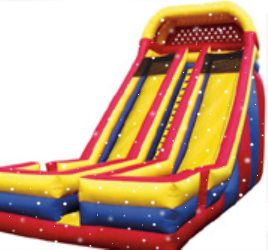 (2 in Stock) Wet or Dry, it's your call on this large slide. The unit will provide hours of fun for your kids. The front loading design gives an attendant/supervisor the control necessary to monitor the flow of traffic on the slide. This is important for safety when trying to control different sized kids on the slide. Just in time for the Summer Heat!! This is a slide with a climbing wall incorporated with the unit. 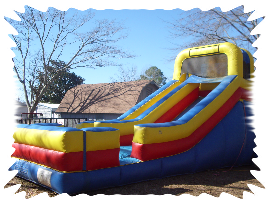 This slide is on loan for the Summer from Bama Jump of Tuscaloosa. 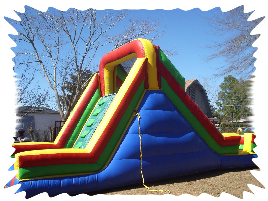 Bama Jump is the Tuscaloosa branch of Jumparoo. 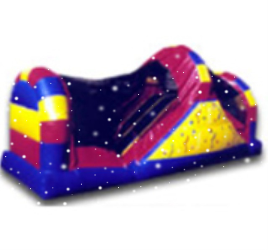 This 18 foot slide is the largest in our inventory. Enter from the left and exit to the right on this fast moving slide unit. Great for Fund Raising activities since you can control the flow of traffic to keep it at the optimum level. As with other wet units, book early! 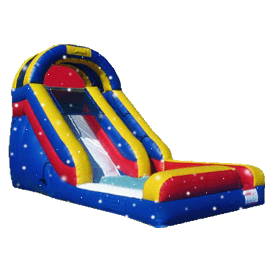 The classic slide attraction with a twist - The stairs are in the front. This keeps your group together and ensures that the fun just keeps on flowing. Any kid will be thrilled to have this at their party! Great for Fund Raising activities. 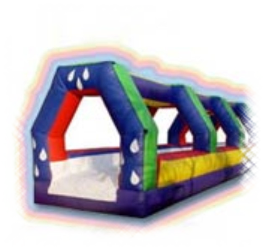 Jumparoo Inflatables offers great corporate rates for larger events. 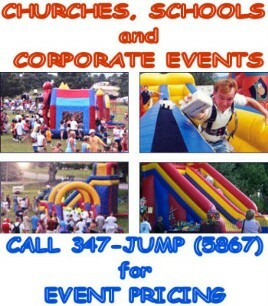 Call (334) 347-JUMP today to book your large events. We have gone as far as Prattville, AL and all the way down to Pensacola, FL for larger events. Larger events require a minimum order due to the distance traveled and time expended. 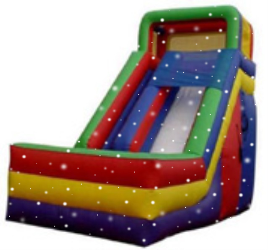 CALL today and let Jumparoo Inflatables service your event!! Check out this front loading dual lane slide. This slide is just too much for words. A must for your next party or fund raising activity! 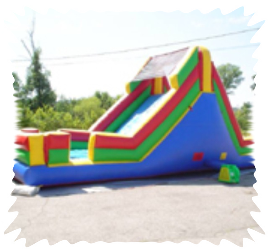 This slide was a hit at Freedom Fest 2008!